I pretty much consider coffee to be one of life’s greatest simple pleasures, and over the past year, that’s evolved from a love of coffee in general to a love of lattes in particular. For a while I tried just adding cold milk to my espresso, but lukewarm lattes aren’t quite as tasty as their hot counterparts, and I began looking into alternatives for steaming and frothing my milk. However, the reviews on pretty much every device out there are iffy, and I just couldn’t bring myself to add one more kitchen gadget to my cabinets, so I started heating my milk in a saucepan. I then realized I didn’t even have to sacrifice my froth. It turns out that you can get milk pretty frothy with a good ol’ fashioned whisk, and while it may not be perfect coffee house froth, it’s definitely good enough to serve at home. Every afternoon I sit and sip one of these cinnamon lattes…with extra foam, please! 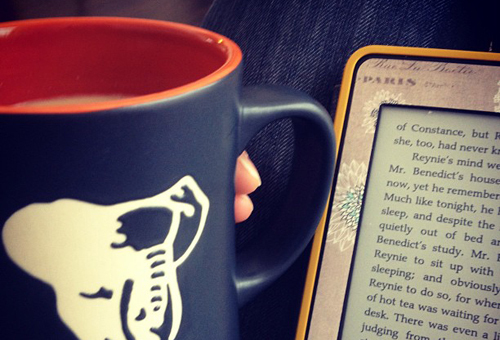 Add cinnamon stick and sweetener to your favorite mug. Brew your coffee or espresso and immediately pour into the mug. 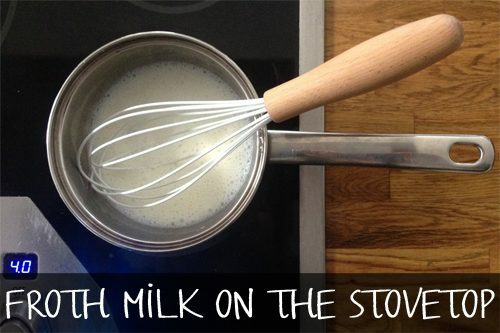 In a small saucepan, heat milk over medium low until steaming. Whisk briskly and then pour over coffee. Optional: If you prefer, heat your milk in the microwave instead of the stovetop. Join us over the next few months for even more quick tips from a minimalist kitchen!